As every educator knows, great teaching is a collaborative effort. Sharing knowledge, ideas, and content with fellow teachers is an essential way to take your pedagogy to the next level. But sharing lessons through Google Drive can be messy. If your sharing permissions aren’t set correctly, you can spend all day fielding access requests — or, worse, accidentally letting others edit your original file. It’s also difficult to show the recipient what they’re receiving, meaning a lot of time spent sifting through files to find what’s relevant for your classroom. And of course, if someone passes on something you created, your name can end up detached from your own content. That’s why we’re excited to introduce a brand-new Pear Deck sharing tool. Sharing your lessons and vocabulary lists is easier than ever! We’ve put together a handy video to help you get started, or if videos aren’t your thing, read on below for a step-by-step breakdown. When you’re in Google Slides with the Pear Deck Add-on open, you’ll see a new “Publish” button at the top of the sidebar, right beside the “Present” button. Click that to get started. If you’re trying to share a vocabulary list, open it in the Vocabulary editor, then look for the “Publish” button near the top of the screen. 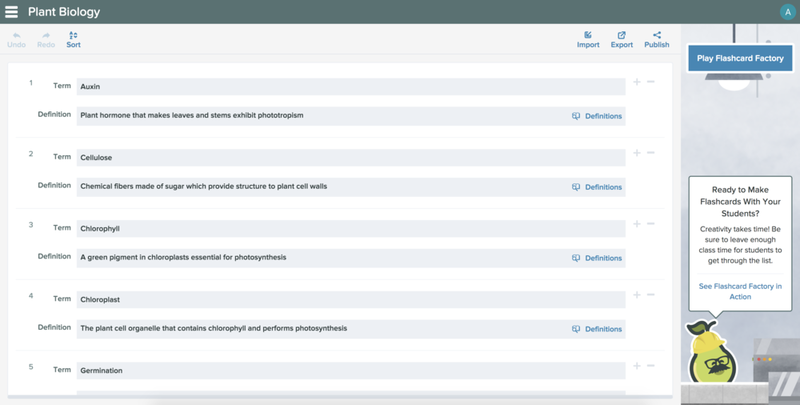 When you’ve published your file, you’ll see a handful of new options. You can share right away if you’re confident everything looks the way you want, make further edits to your information, or preview your published file before sending it out. On the preview screen, you’ll see how others will view your lesson. Teachers can click through a preview of your slides and view the details you provided earlier. Click “Edit Lesson” to go back and change the details, or click on the Link button to copy a shareable link to your clipboard. If you’d like to share it on social media, click the Twitter, Facebook, or Pinterest buttons to send it out in one click. Did someone send you a Pear Deck lesson? Lucky you! 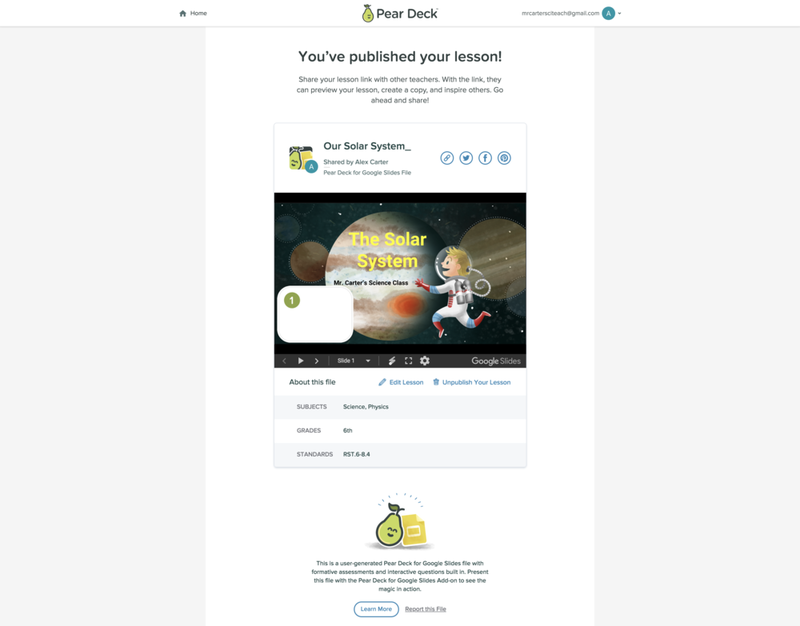 When you click the link you received from your fellow educator, you’ll be taken to this page, where you can preview the Deck and look over the details. When you’re ready, click “Copy File to Drive” to save it for yourself. Tip: If nothing seems to happen after you click “Copy File to Drive,” make sure you have any pop-up blockers disabled. A new tab needs to open to copy the file! Your newly-copied lesson will open in Google Slides (or the Vocabulary editor). You’ll notice that a GIF sticker has been added to the first slide with instructions on how to use the power of Pear Deck. When you feel confident that you’ve got it, just delete that sticker before you present to your class. And feel free to adapt the file for your own classroom — any changes you make will only affect your own copy, so edit away! And that’s it! Chances are, you’ve got lots of brilliant lessons just waiting for their world premiere. We hope this new sharing tool gets you excited to collaborate with your fellow teachers. Happy sharing!